In July, 113 volunteers on Maranatha’s Family Project served at Getare Seventh-day Adventist Academy near Kisii, Kenya. Participants of all ages, from 2 to 93 years old, helped to build a large classroom on campus, as well as six churches in the surrounding communities. Medical clinics and Vacation Bible School programs rounded out the project. 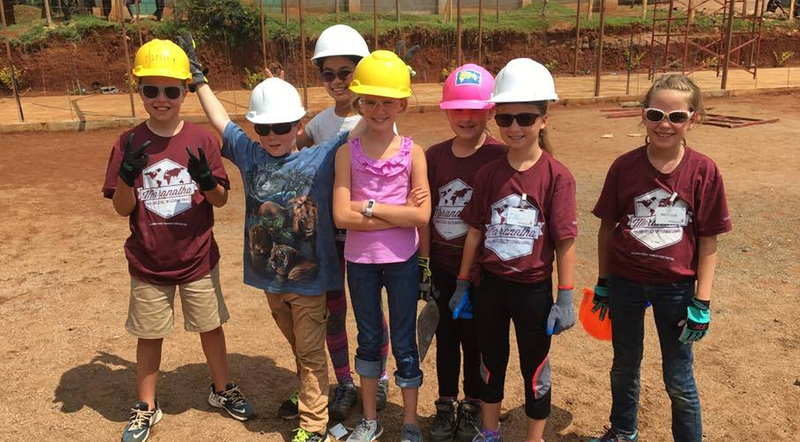 The mission trip was designed specifically for families, so in addition to the construction and outreach activities, the Kenya Family Project included a day camp for kids. The young volunteers learned how to lay block and assisted in building the walls of the classroom. They also interacted with students at the Getare school and had numerous opportunities to immerse themselves in aspects of Kenyan culture. Some of the children’s experiences included bargaining at the produce market, learning to cook local food, walking a mile and a half to fetch water from a well, and carving soapstone, a local specialty. The children also assisted with Vacation Bible School (VBS) programs in the surrounding villages. One of the VBS sessions was held at the Mwata Adventist School for the Deaf. After discovering that the girls were sleeping three to a bed in the girls dorm, volunteers outfitted the girls and boys dormitories with new mattresses, blankets, sheets, pillows, mosquito nets, and storage trunks. Currently, Getare serves more than 600 students. The new buildings replace dark, mud classrooms that were disintegrating from wear. With the new Maranatha classrooms in place, school officials expect enrollment to increase, immediately. At the end of the project, volunteers dedicated the newly constructed classroom. Each student also received a personal Bible, which was funded by volunteers from a previous Maranatha project at Getare. Family Projects are designed for participants of all ages and encourage a family’s spiritual growth through service. Maranatha offers at least two family projects a year. This year, in addition to this trip in Kenya, there was an earlier family project in Guyana in June, and a third is scheduled for Panama during the Christmas holiday. Look for upcoming Family Project opportunities on our website.